I think this was another boing boing link, as so many are, but I’m not sure. I’m contemplating how this theory of “honor system” payments translates to the digital world. I can see it working in a bakery because people have a real tangible item in their hand that they will have a harder time telling themselves they didn’t steal, than they would if it was just a digital copy of your e-book, or access to a community. When Bergen and his partners first started discussing the concept of the City Café Bakery, Bergen was more interested in how things would be done at the business, as opposed to exactly what would be made. For that reason, things are run a little differently at the bakery. Case in point: City Café doesn’t have Interac or accept credit cards. Neither will you see a cash register in the bakery. Instead, customers add up how much they owe themselves and drop their money into a fare box from an old bus. Because it is up to the customers to total their purchases, Bergen has simplified the cost structure. The bakery conducts audits every six months and Bergen says only once did things come up short. There are a great many things we shouldn’t collectively forget (9/11 and WWII come to mind amongst them), so that title is a bit nebulous. The photographs linked to are not. They are some very gritty and painful to view images of the devastation that the bomb dropped on Hiroshima caused. The Robert L. Capp collection at the Hoover Institution Archives contains ten never-before-published photographs illustrating the immediate aftermath of the Hiroshima bombing. These photographs, taken by an unknown Japanese photographer, were found in 1945 among rolls of undeveloped film in a cave outside Hiroshima by U.S. serviceman Robert L. Capp, who was attached to the occupation forces. Unlike most photos of the Hiroshima bombing, these dramatically convey the human as well as material destruction unleashed by the atomic bomb. Mr. Capp donated them to the Hoover Archives in 1998 with the provision that they not be reproduced until 2008. So many acts of war are tragedies, and it is often that we feel safe in our developed world that we know we’ve got the superior military might (especially the atomic bomb). It’s far too easy to think lightly of that atomic bomb in something akin to the Stalin (I think it was Stalin, may have been Lenin, vaguely sure it was a Soviet) quote about “one death is a tragedy, 1000 deaths is just a statistic.” Each of the people who have died in each of the wars has had a family. Many of them husbands and wives and children, most of them at least parents. All of them with somebody who loved them for their quirks and eccentricities just as we all love our family and friends. Very few were attempting to be evil, most were just trying to be good citizens, and far to often it’s the “collateral damage” who want just to go do their daily job and spend time with their family who pay the highest costs. Go look at the pictures, and then remember that “we do not have a monopoly on virtue any more than our enemies have a monopoly on sin.” And maybe go give the wife and kids a hug and kiss, and thank whatever you will that they’re here today. No, you can’t always hire exceptional people for these jobs. No, you can’t always invest enough time to train them sufficiently. But yes, you can make, “pretending you care,” a barely acceptable alternative. Great bit of “business theory” for people in customer service positions there. CS and Help Desk are both largely thankless positions which occasionally attract a realm of semi-competence and bitter snarkiness. I like the somewhat zen plan of accepting the issues with those positions, and just getting people to at least pretend that they care about the job/customer/product… a sort of fake-it-till-you-make-it for customer interaction. The Mudge sent me this link on an interesting look at animation. I’m a big fan of Pixar for their adult accessible, but still kid friendly, films even if this guy doesn’t give them a lot of credit. I’m also a large Studio Ghibli fan (we agree on that), so I’m interested in a couple of the flicks he mentions here. The art-style is wonderful, each frame a delight. Not since Belleville Rendez-Vous has an animation seemed so stylistically fresh and original. However, what struck me most about the film is how fantastically intelligent it is. Usually, animation is not the place for social commentary: but Persepolis is a deliciously dark biopic, laden with black humour, fascinating Iranian history and challenging examinations of religious oppression and political dictatorships. And it is all tied together through an instantly accessible coming-of-age story. It is a completely engrossing narrative, and is one of the most thematically rich films I have seen recently. That got me thinking about other recent animation milestones. Such thoughts instantly reminded me of Spirited Away, which in my opinion, remains the pinnacle of animation as art. I remember being stunned when I finished watching it for the first time, unable to fully comprehend the wealth of stunning imagery I had just witnessed. While not as socially aware as Persepolis, it is possibly even more attractive than the stark black-and-white imagery of the latest French release. Other Studio Ghibli films – from the environmental concerns of Pom Poko to the touching humanity of Grave of the Fireflies to the very small-scale stories of Only Yesterday or Whisper of the Heart – also do something completely unique with the medium, providing experiences unlike any other. He somewhat “belittles” My Neighbor Totoro in the piece, which I think shows a lack of age on his part more than anything. There is something in Totoro that my wife doesn’t get either, so maybe it’s not age. For me there is a great underlying magic to Totoro and not just the character magic, but the sibling ties, and the wonder at life that the girls both “get” that makes this a deeper film than most give it credit for IMNSHO. FAME, I’m not gonna live forever. A) sorry for the bad musical TV pun.B) I posted this on my site Wordtrip, and on my Twitter feed, and I think on one or two of my other sites, but realized I’d never put it up here. There are several articles in sfgate.com on FAME and Dr. Frank (my uncle the actual doctor, not “Dr” Frank one of my favorite musicians).For those of you who don’t know the story (it’s detailed in the articles), basically my uncle almost died on a trek up Kilimanjaro and decided to do something more. Here’s the little excerpt about his “epiphany” moment. Artress led his wife to a rock, and they sat together above the clouds. Then it hit him. He wasn’t afraid to die; he was ashamed. He had lived only for himself – practicing medicine in a Modesto hospital, traveling with his wife, purchasing luxury vacation homes and collecting art. He felt as if he had nothing to show for his 50 years. He felt as if his life had been a waste. In that moment, Artress and his wife realized they were living for the wrong reasons. In that moment, everything changed. He’s doing some great work in Tanzania, and if you’re looking for a charity to donate your dot-com millions give them a look. I read this book a bit ago, and while I don’t agree with a fair bit of what he had to say (and he managed to run his thesis that “any utopian dream is prone to causing bad action” into the ground so many times it wasn’t funny) there were quite a few passages I found interesting. Below are few of the sections I had marked for later (my favorites are in bold)… they’ll probably come into play in some commentary/essays on one of my sites later. Page 15: “The experience of transcendence — the struggle to acknowledge the infinite — need not be attributed to an external being called God. As Karen Armstrong and others have pointed out, the belief in a personal God can, in fact, be anti-religious. But the religious impulse addresses something just as concrete as the pursuit of scientific or historical knowledge: it addresses the human need for the sacred. Page 37: “Our enemies have no monopoly on sin, nor have we one on virtue. We all stand in need of self-correction. We do not live in a world where we ever get to choose between pure virtue and pure vice. 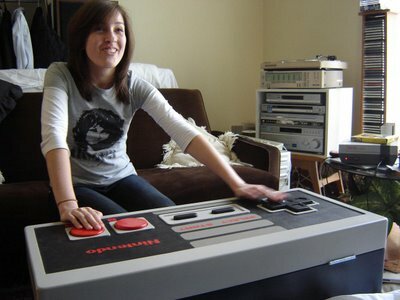 We already defined Awesome… now we’ve got Ultra-Awesome though I think the MAME Tardis is probably more awesome than this still-pretty-freaking-awesome coffee table sized NES controller). 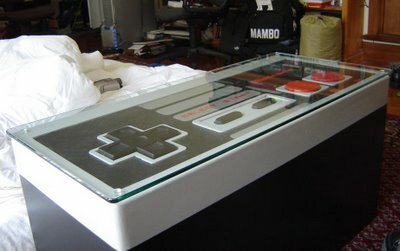 I’ve finally finished my giant NES controller/ coffee table/ storage box! Awesome! The piece of glass that I had ordered arrived today, it looks super fresh. Just have to post this one for Holly (Jake’s violin teacher, and our good friend). A violinist who left his 285-year-old instrument in the back of a New York cab has played a concert to thank the driver who returned it to him. Philippe Quint gave a private 30-minute performance on Tuesday in the taxi waiting area at Newark Liberty International Airport. He left his violin, a 1723 Kiesewetter Stradivarius, in a taxi on the way back from the airport last month. The driver, Mohamed Khalil, got in touch the next day to return it. “I cannot describe it in words, the feeling that I was going through at the time. I was frantically looking for the violin that whole morning,” Mr Quint said. Sir David Attenborough, one of the BBC’s longest-serving presenters, has criticised the broadcaster for allowing lifestyle shows to “run rampant”. “Do we really require so many gardening programmes, makeover programmes or celebrity chefs?” he asked. Sir David said it was “a scandal” that there was “no place for continuing series of programmes about science or serious music or in-depth interviews”. The presenter was giving a speech about public service broadcasting in London. He singled out the BBC’s long-running science show Tomorrow’s World as a “very inventive programme”, and said the demise of such strands was “sad”. I find myself linking to Chad Perrin yet again (as I get caught up on some of the articles on his site). Employ a business model defined by the customers. That’s about it. There’s no imposition of business model from above in the form of legal limits. There’s no trying to make the customer base conform to a preferred way of making money. There’s no coercive marketing, high-pressure sales, or obfuscation. There’s no priesthood of product or service development dealing with the supplicants of the customer base. I’ve got a couple of websites that I run “on the side” and for my main one (Wordtrip.com) we managed to hit #2, with a bit of off-the-shelf #1, and some poorly directed (on my part) #3. #4 is an interesting one because apparently my “non-obvious means of turning a profit” has been to just not turn a profit. That may be a bit TOO non-obvious.